Hi, I’m Ellen Gray. Inspired by my father, I began competing in triathlons in 2007 as part of a relay. Two years of competing in relays gave me the confidence to complete my first sprint triathlon, and I still say relays are great for getting started. Since then I’ve done 14 more races ranging from sprint to half ironman in length. I absolutely love this sport, because no matter what your ability or body type, you can succeed. Crossing the finish line is a victory for the first to the last athlete. I am especially grateful for each finish after overcoming several injuries over the past few years. My main inspiration is helping out those new to fitness get started so any questions, just ask! 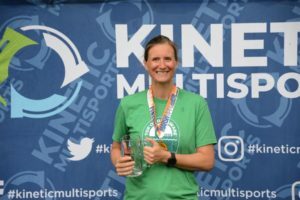 I would also love to see more young people at Kinetic Multisports races, and am super proud that my son did two events last year and I hope to get my daughters involved too. Besides triathlon training, I teach fitness classes and coach a weight loss program at my local YMCA. I also love spending time outdoors with my husband and three children and traveling off the beaten path. See you out on the course – I’m the almost 6 foot tall blonde in the back of the pack!